If you’ve made up your mind to cancel your car insurance but you’re not sure where to start, we’ll walk you through the process. Maybe you have just been considering canceling your car insurance coverage. Is that a good step to take? A wise step? What’s the worst that could happen? Well, we’ll give you some things to consider when making your decision. We’ll start off by listing some reasons why you might consider canceling car insurance coverage. If you’ll need continued coverage but aren’t sure if you should cancel your current policy, at the very least you should compare car insurance quotes. You can do that right here! You might find that you’re better off staying with the company you have now, or you might be far better off canceling coverage with your current insurer and switching. If you’re looking for something specific you can jump to a section by clicking below. – Will canceling affect credit? – Will I get a refund when I cancel coverage? – Should I cancel coverage for my child at college? – Can I cancel my policy online? Your reason for canceling coverage is the biggest factor in determining if it’s a good idea. Just remember this key point: If you’re planning to be driving, you need insurance. Yes, you definitely want to cancel coverage on a vehicle that you have sold! This is a great reason to cancel coverage. You certainly should not keep paying for coverage on a car you don’t own. Remember that your vehicle plates belong to you and should not stay with the vehicle when you sell it. If you don’t take your plates and the new owner gets into an accident, there could be some insurance confusion. Keep in mind that if you have bought or will buy a vehicle to replace the one you sold, you’ll have to have coverage for that. You’ll have to contact your insurer, but it’s a fairly simple and straightforward process to remove the coverage from your sold car and add coverage to your recently purchased car. In that case, you won’t be canceling coverage. If you sell your car and have no plans of purchasing another, then you will want to outright cancel your coverage. Keep reading for tips on what to do about insurance if you’re not going to be needing a car for a while. Maybe you’ve decided to put your car in storage for the winter or you’re going on an extended trip. Perhaps you’ve decided pedal power and public transportation will be your new means of travel. Whatever your reason, there are points to consider to help you decide if canceling coverage is the route you should take. In some states, like Kentucky, you’re required to keep minimum coverage limits on any vehicle you own regardless of whether you’re driving it or not unless you surrender your license plates to the County Clerk’s office. If your vehicle is financed, your lender will likely require you to maintain full coverage regardless of your vehicle storage status. If your state requires liability coverage, make sure the limits you carry on the stored vehicle are the minimum required. If your state allows you to drop coverage from a vehicle not being driven, consider dropping liability coverage while maintaining comprehensive coverage. That way if something happens to your car in storage, the damage will be covered. Remove any unnecessary coverage options. If you have rental coverage, remove it. If you pay extra for roadside assistance, take that off your policy. Raise your deductible for comprehensive coverage if you believe your risk for damage to be low. Suspend coverage if your insurer and state allow. If you’re going to be out of the area or even out of the country and you know you won’t be driving your vehicle, it doesn’t make sense to keep paying for insurance on it. Keep in mind the tips for a car in storage listed above because many of them apply to this situation as well. Your state may require a vehicle you own to be covered. Your lender may require coverage even if the vehicle is not being driven. Call your insurance company and see if they can help you get your premium down as low as possible while still maintaining any coverage types you want (like comprehensive) or need (like liability where required). Maybe you decided to try out public transportation and ridesharing services to see how that lifestyle treats you. If you’re not ready to make a lifelong commitment to that sort of transportation and may consider buying a vehicle a few months down the road, you might consider a non-owners policy. That will cover you if you borrow your friend’s car and if you rent a vehicle. A non-owner policy will prevent a coverage lapse which would probably hurt your rate if you do start driving again. If you’ve committed to not driving for several years, the cons of the increased premiums after a coverage lapse will be outweighed by the pros of not paying monthly premiums while you’re not driving. This is the most common scenario for wanting to cancel coverage. You found cheaper coverage, and you want to switch carriers. The National Association of Insurance Commissioners (NAIC) provides a convenient checklist to compare quotes. Put your current insurance information under “Company 1” and then compare other quotes. 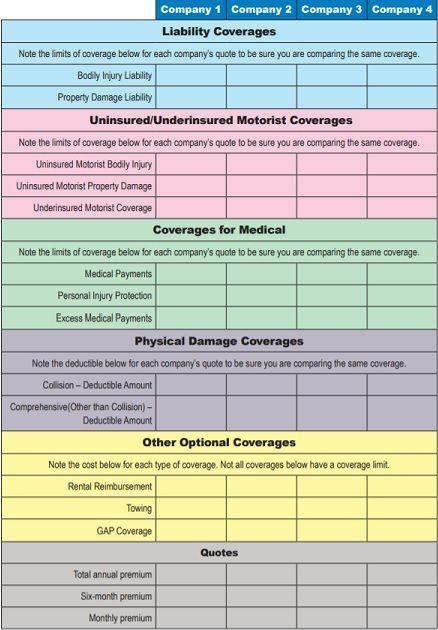 This comparison sheet will help you make sure you’re comparing identical coverage. Before you cancel, it’s a good idea to give your current insurance provider a call to see if there are discounts that could be applied to get your rate down to where it would be if you switched. Before you cancel, make sure the company that looks better is legitimate. If everything checks out, proceed to purchase the new insurance coverage and cancel your old policy. Just make sure the dates line up so you don’t have a coverage lapse. Also, check out our checklist to make sure you haven’t forgotten anything. If you have a move coming up, you’re going to have to actually MOVE before you can transfer insurance to your new state of residence. Once you’ve moved, you’ll have a set amount of time (varies by state) to register your vehicle in that state. You’ll have to show proof of insurance to register so you’ll need to figure out your insurance coverage before you register your vehicle. Your level of coverage will likely change as different states require different levels and types of coverage. Your premiums will likely change. If your current provider isn’t licensed in your new state, you’ll have to change insurers. Compare quotes for the zip code where you will be living. Choose three or four providers that look best to you and check their financial stability and customer satisfaction ratings. When you pick your new insurer, set a start date, then cancel your previous insurance with an end date on the same day as the start date with the new company. This step will ensure you have continuous coverage. Seems easy enough but you’re going to want to keep reading so you don’t find yourself with problems! Unfortunately, there’s always the potential for problems no matter what you do! But don’t get worked up about it! We’ll help you prepare for what could happen so that your cancellation process is smooth and pain-free. When you’re canceling coverage and switching to a new provider, the first thing you’ll want to avoid is a lapse in coverage. We’ll tell you why, next. A lapse in car insurance coverage is any period of time – even just one day – that you’re not covered by car insurance. To avoid a lapse, you want to make sure your new insurance is set to be in force on the same day that your previous coverage is set to be canceled. You may think that gives you an overlap of a day, but it doesn’t. As you can see in the chart above, your old insurance will end at 12:01 a.m. on the stop date while your new insurance will start at 12:01 a.m. on the start date. There will be no overlap, but there will be continuous coverage. What’s so bad about a lapse, anyway? Well, it goes on your record and you will likely be charged higher premiums when you start new coverage because of that lapse. If you know you won’t need insurance for a year or longer, the higher premiums after a lapse will be worth not paying anything for that year or longer. If it’s a month that you won’t be driving, you are better off continuing coverage. You can cancel your car insurance coverage at any time. Even though you may have a six-month or 12-month policy, you’re not bound to keep it until renewal time. If your company charges a percentage of unused premiums, you’ll want to consider that wasted cost and decide if you’re better off waiting until renewal to cancel coverage. There are hundreds of car insurance companies and there is a wide variety of cancellation processes. We’ll show you the cancellation costs of the largest insurers in the U.S. The companies represented above make up the majority of the market share in the U.S., but if your company is not listed, you can call your agent to find out what kind of fees you’d be looking at if you decided to cancel before your policy is up for renewal. You’ll be safe from fees if you cancel at renewal time; there won’t be any fees no matter what company you use. If you think the easiest way to cancel your insurance is to just stop paying, think again. A lot of companies (most in fact) have a grace period where you are covered if you’ve forgotten to pay or don’t have the money when the payment is due. You might be responsible to pay for coverage during that grace period. For example, your next payment is due in February to cover March’s coverage. You proceed to secure new coverage that begins on March 1, and you don’t pay your previous insurer, but your old company has a 20 day grace period, so they cover you up until March 20. So now, you’re paying your new company starting in March, and you’re responsible for paying your old company for the first 20 days in March. Don’t get yourself into that situation. To get to the point, stopping payment with no communication is not the route to take when switching companies. Also, this may be stating the obvious, but it needs to be said: If you have set up automatic payments, they’re going to keep paying automatically unless you stop them. As previously mentioned, by not contacting your insurance company about your plan to cancel coverage, you might end up double paying and as if that’s not bad enough, you’re going to look bad! No one wants to look bad! But that’s exactly how you’ll look if you decide to cancel your coverage by simply stopping payments. Communication! Communication is key. Talk to your insurance provider. Tell them that you’re canceling and when you want it to be final. We will give you a list of all the possible ways you can cancel insurance, but let’s make this simple. Call your agent! There are other valid options, but we’ll start with this one because, in most cases, it’s the easiest and best. You may be asked for your name, and address, and possibly your social security number, but those are things you probably don’t need to prepare. The following information you’ll need to dig up and be prepared with no matter which route you choose. Be prepared to have to sign a form with the requested cancellation date listed and mail or fax it to your current insurer. Your agent will tell you exactly what to do. If your car is leased or financed, the lienholder will almost always require that you carry full coverage. Since your lienholder’s name will be on your insurance policy, your new insurer will probably inform them of your coverage, but confirm to be sure. What you don’t want is for your lienholder to think you are uninsured and secure an expensive force-placed policy. Companies don’t want you to cancel your insurance coverage, so searching your company’s website isn’t usually the most productive way to find out their cancellation policy. You’ll usually be directed to call an agent while the page will list ways you can save by staying with them. State Farm is the largest car insurance company in the U.S. by market share and they provide a perfect example of a website directing you to call an agent to cancel while listing reasons to stay. Pick up your phone. Google search your agency number (unless you already have it saved in your contacts, then find it there) and call it. Tell them you’d like to cancel your coverage. Ask what their cancellation policy is and tell them when you’d like to stop coverage. Remember, you want to stop it on the same day you start your new coverage. Calling on the phone would be the quickest and most direct way, and by having a conversation, you may find out that there are discounts that could be applied to your coverage that may lower your premium enough for you to stay with that company. Here’s the contact information for most of the largest insurance companies. Going in person is a valid option. It’s just about as simple as picking up the phone. Sometimes it’s clearer to talk to someone in person, so if you’re feeling confused, this may be the best option for you. And like with a phone conversation, if you talk to your agent, he or she may be able to find more discounts or ways you can save. If the dread of having a vocal conversation plagues you, as it does many in our texting world, you can send an email to your agent. The process here will be similar to a phone call, except there will be a little more time between questions and answers. There are many cancellation form letters available online. You can simply print one out, fill it in and mail or fax it to your insurer. The problem with this method is that you won’t find out if you are eligible for discounts from your old insurer. You can fill out a cancellation form, sign it, and ask your new agency to fax it to your old agency. This option will probably work if you’re dealing with a brick and mortar agency. It won’t be feasible if you’re working with an online-only car insurance company. Root car insurance (an app-based insurance company) among others, advertises that they’ll cancel your old policy for you when you switch to them. Now THAT makes things easy! We summed up everything next! Make sure you don’t miss a point when you’re canceling car insurance. You may have more questions. We’ll answer some of them next. Simply canceling will not affect credit. Just neglecting to pay might if you were covered by a grace period which you didn’t pay for and then it’s sent to collections. That is very unlikely as you will be contacted by the insurance company and given ample opportunity to pay before collections enters the scene. You might. If your premiums have been paid for coverage that extends past the cancellation date, you’ll get a prorated refund for the days you are no longer covered minus any cancellation fees (if there are any). Probably not but if your child is over 100 miles away and not driving, you may be able to qualify for a discount. Usually not. Insurance websites often direct the customer to call an agent.